Pic RGB color generator | Enide! 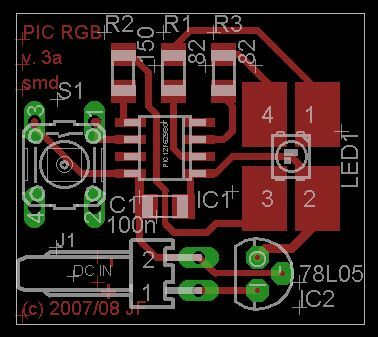 PIC RGB is a circuit that generates random RGB colors using a RGB LED and fades between them. The idea for this circuit came from the candle simulator  and another project called TinyRGB  . The challenge was to create an algorithm that could fade 3 independent colors at different speeds in the same time interval, using integer math, (of course). There are other enhanced versions of this project named Pic RGB Power board and Pic RGB Power board with Infrared remote control. Both circuits drive a powerful 3W Prolight RGB LED. The PIC may be any small 12F***, as long as they have 1KWords of flash and two timers. Below at the downloads section are two hex files for PICs 12F629 and 12F675 . Basic schematic includes a voltage regulator 78L05, the PIC with a decoupling capacitor and a few resistors. Since each PIC pin can supply a maximum of 25mA of current, and the LED specification indicates a maximum of 25mA, the LED resistors were calculated to provide 20mA of current in each color. The push-button switches between running modes, random and sequence. The PCB and Schematic were created using Eagle from Cadsoft and are available below at the downloads section. Click on the image below to expand it and have a look at the top placement information. Note: PIC pin1 is the lower right one. The software is written in C and consists on a random number generator, an intensity fading function and a triple PWM modulator. The triple PWM modulator uses just one timer for all the output signals. All three color components have 256 levels of intensity and there are two working modes: random and sequence. The random number generator is the same from the candle simulator, except that it now returns a char. The previous version returns a single random bit. The fading function has undergone three evolutions along the process of development, each being an improvement of the previous one. Version 1: uses a simple step algorithm to determine the increment of each component, from the current color to the final color. Each iteration cycle adds the step value to the current color component value. Since the math is only integer based, there is an error reaching the final component values which makes impossible to show the right color. To solve this, each component step receives a extra 1. Now this extra one causes another problem... it may give a final component value bigger than the expected. So when the last iteration cycle is reached the correct final value is forced, rather than summing the step. Version 2: uses pre-defined colors with the previous step algorithm. It didn't provide good results and was abandoned. Version 3: Calculates the step and the error when reaching the final value. Then it calculates the number of cycles in which the error is going to be distributed (error period). In each cycle it adds the step value and an extra 1 from the error if the cycle number if a multiple of the error period. What does it mean? It means that Red will not be incremented in 40 cycles at all. It means that Green is going to be decremented 1 in each cycle, because of the step, and an extra 1 every 4 cycles, because of the error. And finally Blue will be decremented every 2 cycles one unit because of the error! Finally the PWM modulator controls the brightness of the LEDs. There are several ways of creating the PWM signal, this time only one timer was used. To be able to display 256 levels for each color component from 50Hz to 100Hz, the timer must run from 50*256 interrupts per second to 100*256 interrupts per second. There's a counter variable associated with the timer which is incremented every time the timer generates an interrupt. Every time the counter variable overflows from 255 to 0, all 3 components (R,G,B) are turned on. In the following cycles the color components will be turned off when their values match the value of the counter. The sequence mode differs from the random mode because the colors emitted by the LED are pre-programmed. The sequence is Green, Green/Blue, Blue, Blue/Red, Red, Red/Green and starts over. To switch between the random mode and the sequence mode press the button connected to GPIO1 (pin 6). Version 1 looks nice but the final fade cycle is always noticed because it produces a sudden brightness jump. Version 2 is really bad. Version 3 is working great for some time now. The fade is really nice and smooth! There are no noticeable flickering effects or sudden jumps and the sequence mode is always a good alternative to just show off the circuit. Compiling and running with the PWM at 100Hz you'll need to turn on code optimizations in HI-Tech picc otherwise there is not enough time to complete the ISR before another interrupts occurs. This is because the timer generates 100*256 interrupts per second and the PIC is being clocked from the internal 4Mhz oscillator. The time between interrupts is 39us and running at 4Mhz the PIC is able to execute an instruction every 4*1/Fosc = 1us. So it is possible to execute, at most, 39 instructions inside the interrupt service routine. The resistor values are not critical. In fact you may choose values above or below the theoretical ones that make the light more pleasant to you. I'm using 200 Ohm for Red, 150 Ohm for green and 100 Ohm for blue and the amount of light coming out of the LED is huge and somewhat blueish! 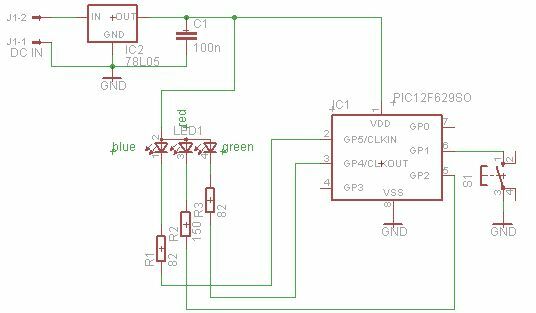 Note: I'm using a common anode rgb LED in which whenever I want to enable one LED, I have to drive its corresponding PIC pin to 0 and vice-versa. If you want to use a common cathode LED, just change the ON and OFF macros in the C file and recompile. It should be enough.